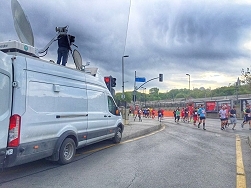 Istanbul half-marathon: DSNG trucks and OB vans used by ACTAMEDYA. 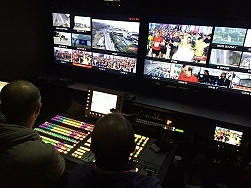 Istanbul, April 2016: The live broadcast production and transmission of last weekend's Vodafone Half-Marathon was organised by ACTAMEDYA, in co-operation with Mediapro Turkey and Kamera Teknik. In order to cover the event, the production team used two helicopters, a Cineflex camera, three motorcycle cameras, two Outside Broadcast (OB) vans, four DSNG trucks and two Octocopters. For the broadcast, fixed RF relay centres were established in three different spots in Istanbul. At the race's start point, eight cameras were set up including a Jimmy Jib, a wireless camera and an Octocopter camera. At the finish line, eight cameras were deployed as well as a Jimmy Jib. In total 20 cameras were used during the two and a half hour production which as well as capturing the sporting event also highlighted the beautiful landmarks of Istanbul. The half-marathon was broadcast live by Aspor. ACTAMEDYA provided the live broadcast of the 2012, 2013 and 2015 Istanbul Marathons as well as the 2015 Istanbul Half-Marathon and the 2016 Adana Half-Marathon.